The Los Angeles Police Technical Investigation Division is in Piper Tech. The Elections Bureau is in there. A room with boxes no one will let you into is there. There’s a helipad. City Archivist Michael Holland refers to Piper Tech as the city’s junk drawer. The sign in front of the parking lot says “personnel only” but if you ask the security guard for city records, he will point you to the back of the lot and tell you there is an elevator and then you find there is an elevator. If you walk around on the third floor you’ll eventually find a small room, and in the small room are the city’s archive of records going back to the late 1820s when Los Angeles was a miniature Mexican pueblo where about one thousand people lived. 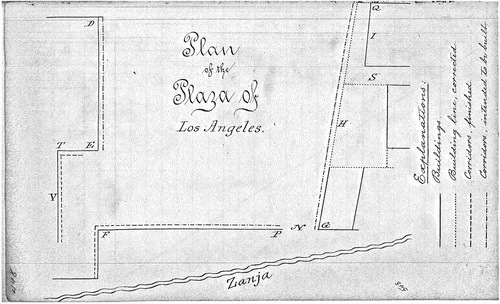 At one point, J. M. Guinn (1834-1918 – he arrived in Los Angeles in 1886) wrote several essays stating that the first plaza for Los Angeles was laid out about where Piper Tech stands. Guinn in his old age gently inserted the real location in his massive Historical and biographical record of southern California: containing a history of Southern California from its earliest settlement to the opening year of the twentieth century (Chicago, Chapman Publishing Co. 1902). Piper Tech is just about where Mr. Pryor’s house was, and that house was within a vineyard. A little closer to the hills, about where Union Station is, was Casa de Lugo. A drawing by William Rich Hutton created from the front of Mr. Pryor’s adobe and looking towards Fort Moore, the American military’s occupying fort is below. The hill with the flag on the top was Fort Moore Hill, where the occupying American forces stayed. The city removed most of that hill for the 101 Freeway. A lot of the bit that remained was recently excavated for a large multi-use building complex. For years, a tiny restaurant called in Spanish “the hill” stood between Parking Lot No. 2 and Fort Moore Hill. Hutton’s watercolor of the south of the pueblo is below. At the top of one hill is a faintly drawn flag. It is not clear that the flag stood on the hill behind the wooden corral nor does it make sense that the horse stands outside the corral rather than within it. The flagpole is short, so Fort Moore was probably on a hill behind the hill on the foreground, which suggests that this painting was made of an area near the base of Bunker Hill, possibly around Pershing Square, but that area is not to the south. The perspective is hard to understand today but it is clear the city was tiny. H.M.T. 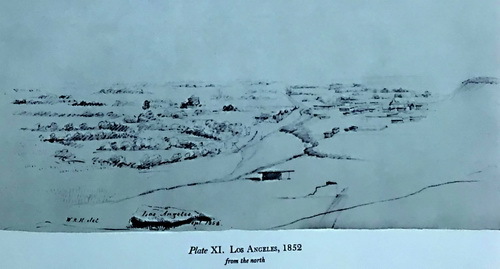 Powell’s 1850 drawing of Los Angeles. The perspective is from Lincoln Heights or Boyle Heights looking across the river at Los Angeles. 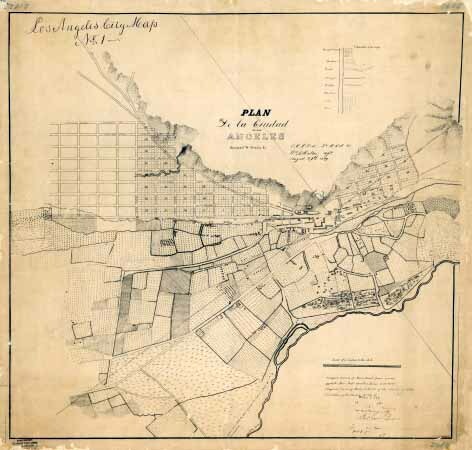 In May 1849, the territorial American governor General Bennet Riley asked the ayunatamiento for a city map and information about granting city lots. There was no map. There was no procedure for granting city lots. There were no city lots although the pueblo was supposed to own four leagues-square of land as a legacy from the Spanish period. No one was clear on what four leagues square meant but it was, whatever it was, a lot of land. 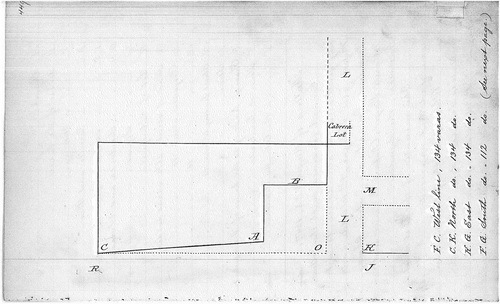 In 1849, young surveyor, topographer and engineer William Rich Hutton worked with engineer E.O.C. Ord on the first survey for the city of Los Angeles. He drew map for the first survey. Both city librarian Glen Creason and Michael Holland confirm the original survey is gone but the city archives has the framed copy that once hung in the City Clerk’s office. The USC digital library has two different versions of the Ord survey. One of those copies of the original shows with lettering that the church – popularly known as La Placita, or little plaza – was in the middle of the plaza; that is, the “plaza” was an amorphous area more or less surrounding the church in 1849. (See, http://digitallibrary.usc.edu/cdm/singleitem/collection/p15799coll65/id/12769/rec1. The USC map text below its copy of the Ord/Hutton map indicates the city’s archives contain the original map but that is not true. Those archives are the Piper Tech archives. The Los Angeles Public Library copy can somewhat be enlarged. It is below. Even without the word “plaza” drawn in, it looks like the church was in 1849 surrounded by open space. E.O.C. 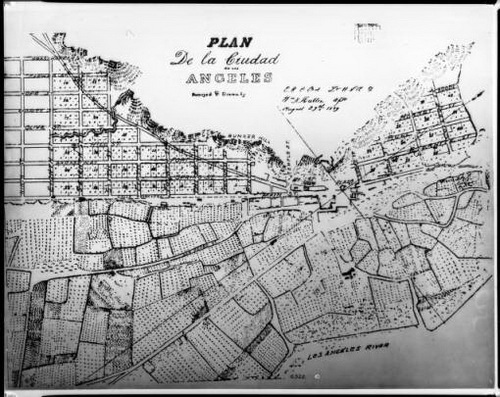 Ord’s 1849 map of Los Angeles at three resolutions, focusing in on the Plaza. The map with respect to the city lots was a work of imagination but you can that the Ord map started from the front of an icon for the church. That was the middle of the four leagues square for Ord. 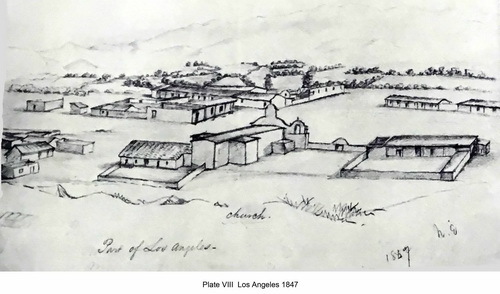 There was no other possible built landmark and Ord no doubt assumed that La Placita was located in the original plaza. Hutton’s paintings of the plaza area confirm that the plaza was not rectangular or circular or triangular or any particular geometric shape. 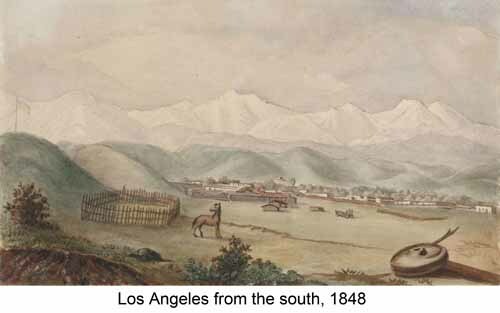 Some of William Rich Hutton’s paintings and drawings of Los Angeles, from the book California: 1847-1852 (The Huntington Library). Harris Newmark’s recollections of early Los Angeles should be read with an understanding that the city he first saw in 1853 was very likely not built around a regular plaza. The colorful Horace Bell’s early plaza stories also did not take place around a formal area. The image of early Los Angeles should be re-figured to show events around a very small untidy open area, which Harris Newmark observed was often filled with garbage that had to be removed for festivals. The Piper Tech archival records show that in 1847, the ayuntamiento drew a plan to regularize the plaza and make it more into – it is not clear from the accompanying city records what the members of the council wanted to make the area look like but they had something in mind. We don’t know what that was, yet: some interpretation of Phillip II’s Law of the Indies? A memory of what the original plaza had looked like about sixty years earlier? If a memory, whose memory was it? In the winter of 1860, a deluge swept away most of everything. 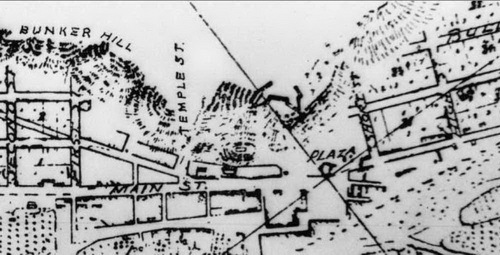 A photograph marked on the Los Angeles Public Library digital archives as 1857 showing the plaza area is incorrectly marked. There is a brick reservoir in the photograph. The reservoir was not built until 1860. The photograph below was probably therefore taken after 1860, suggesting the American-era city government designed the rectangular plaza probably after the flood struck down a large section of La Placita and the church was rebuilt. 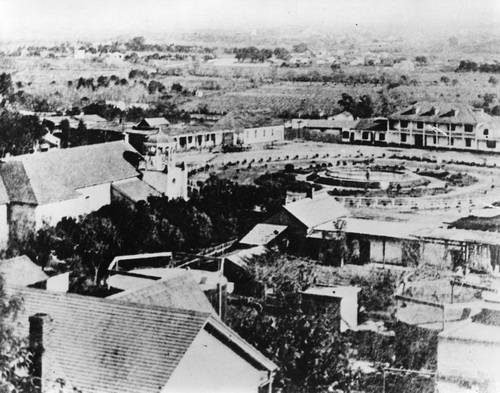 1857 photograph of plaza, reservoir, part of church and Lugo house. Casa de Lugo, built in the 1830s, was the two-story adobe in the Hutton drawings and the Koppel lithograph. Either it moved or the church moved sometime after the paintings and the lithograph but before the “1857” photograph of the plaza. 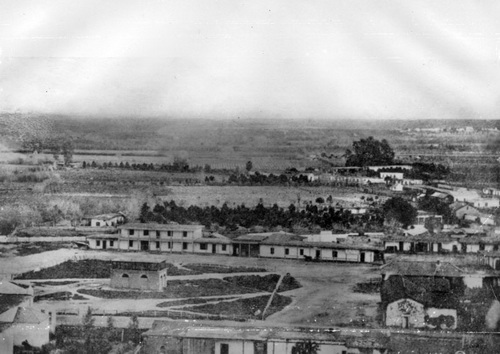 Photo of Lugo House, Plaza, and church in 1875. Mr. Holland walked with me from the archives to a place where we looked out at the city. We stood there for a time, and then I went away. L.A.C.A. Volume IV, 1835-1852, folder 2 of 3, pages 301-608. Translation by Phiapolis Barzac, 1877. 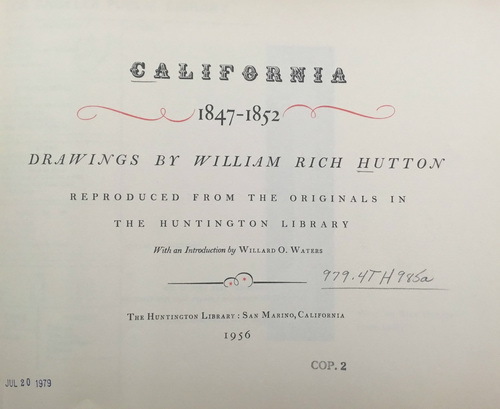 The William Rich Hutton papers are at The Huntington Library, 1151 Oxford Road, San Marino, California 911108. There are two boxes containing 149 pieces. I have not seen these. H.M.T. Powell (Author), Douglas S. Watson, Editor, The Santa Fe Trail to California: The Journal & Drawings of H.M.T. Powell, 1849-1852 (Book Club of California, 1st edition, 1931). There are no Los Angeles government records before the late 1820s. 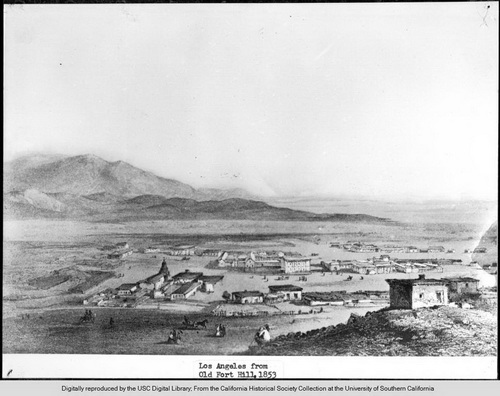 Mexico established Los Angeles as a city in 1834 but most of the pueblo records were kept in San Francisco and destroyed in the 1906 earthquake and fire. Thomas Savage, a researcher for H. H. Bancroft, and his assistants hand copied a great many records, possibly all of the records, in the San Francisco Spanish provincial archives and those copies are kept at the Bancroft Library at U.C. Berkeley. For example, J. M. Guinn, “The Story of A Plaza,” Annual Publication of the Historical Society of Southern California and Pioneer Register, Los Angeles, Vol 4, No. 3 (1899), pp. 247-256. 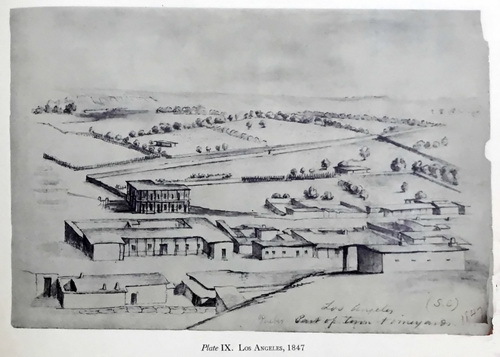 Doyce B. Nunis, Jr., once editor of the journal of the Historical Society of Southern California, later wrote, “We do not know where the original site of the founding of Los Angeles was. No one does.” The only place it could have possibly been was on the river’s then-bank below Elysian Park, south of the confluence of the river and the Arroyo Seco. Available on-line: https://babel.hathitrust.org/cgi/pt?id=njp.32101074884675;view=1up;seq=7. (Retrieved 10/28/2017). There was no title actually. The land was held in usufruct, based on early feudal Spanish law. There was no law in Los Angeles. There were no ordinances. As Guinn points out, the ayuntamiento passed resolutions. 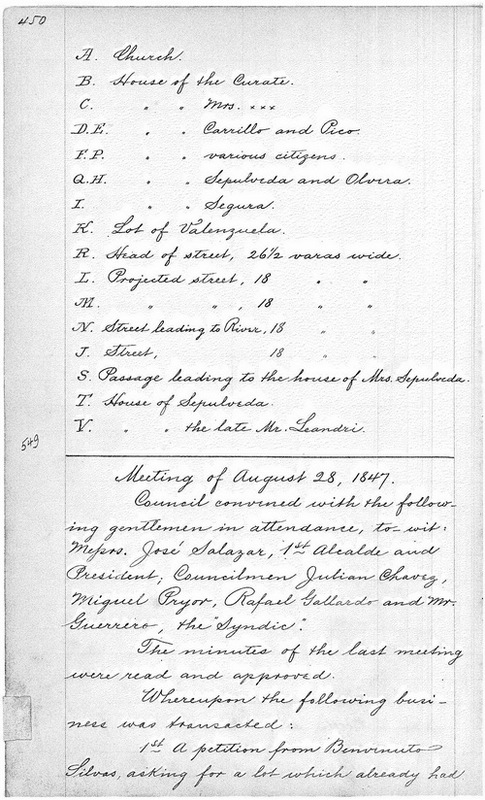 There were, however, minutes of meetings, and an 1877 translation into English of many of those minutes are at Piper Tech. Both Guinn and the later translator made small errors, which are obvious errors. There was, for instance, no city attorney. Guinn’s description of actions attempted by the city government and the earlier street names are at pages 145 through 148. Special Collections Department, Mary Norton Clap Library, Occidental College, Los Angeles. Los Angeles in Maps, Glen Creason, Rizzoli, first edition (October 19, 2010), email 10/16/2017, and Michael Holland confirm the original Ord survey is lost. Harris Newmark, Sixty Years in Southern California 1853-1913, edited by Maurice H. Newmark and Marco R. Newmark, New York, (The Knickerbocker Press 1916). The entire text is available at: http://digitallibrary.usc.edu/cdm/singleitem/collection/p15799coll65/id/12769/rec/1. Horace Bell, Reminiscences of a Ranger, pages 242 and following. (Los Angeles: Yarnell, Caystile & Mathes, Printers 1888).